A quote that I have found. Borders is in Geelong! At last! New Edition must be one of the loveliest book shops in which I have ever had the pleasure of browsing! From the outside it is a glorious old place from the days when they really knew how to design buildings, all stunning architecture and cream paint with these lovely doors - doors that a very like a good bookshop. Inside there is all this space, and wooden floor boards, a counter by the door, and another halfway along the room. They stock new books, and some of the shelving is flush along the wall, some standing shelves, back to back forming u-shaped alcoves in which make for intimate browsing, perfect for the poetry and classics sections! I really enjoyed being in New Edition, and, since they're clever enough to be well stocked, it's just as well I was skint at the time or I would have bought a lot of books! If you're ever in Fremantle you simply must go to New Edition. Here is their website. There is also an Elizabeth's bookstore in Fremantle, and I liked this store more than the other Elizabeth's bookstores I had come across in Perth, mostly because of the Simone de Beauvoir novel I found there, which I had to leave behind in order to be able close my suitcase on the way back to Geelong. Elizabeth's is your usual secondhand bookstore, with the smell, the right sort of shelving, the many many books. However they are well stocked, with a wide range, so they usually have a lot of customers, and only one poor person serving them all. But the Fremantle store has an upstairs section with sale books, which were only one or two dollars each, and so I made my way up there. I love upstairs sections in secondhand bookstores, because usually people are so busy looking at all the books downstairs they don't even realise there's an upstairs - I think this may have to do with the staircase being nearly obscured by books. Though it was hot upstairs at Elizabeth's, and the pedestal fan was never facing in the right direction, I had a good old browse, and found some wonderful books. That was the best, browsing in the huge, open room, all alone. Just me and the books and the heat. And the Simone de Beauvoir novel, one of her shortest, I'm sure, was the topping on the ice cream. I do wish I'd taken that book back with me. But I'm sure I'll find it again sometime. I keep on thinkng that there are not enough regular posts in this bookshop-loving community, and it occurred to me, in my random online rambles, that a newletter or round-up of other bookshop-loving things online is a good way to have regular posting. I'm thinking a bi-weekly one is a good way to go, which will make for 26 round-ups a year. Feel free to submit items by sending an email to bookshop-love @ live.com.au! And, of course, please continue posting about the bookshops that you have merrily perused! First up, another newletter's call for bookshop love, and the comments are what you want to pay attention to. Lots of bookshops are mentioned and described. One person who replied to that call out mentioned Elizabeth's Bookshops, which is a chain of secondhand bookstores in two Australian states: Western Australia and New South Wales. I have been in some of these, and they are delightful places! In the Fremantle store, I found a very cheap copy of a novel by Simone de Beauvoir, but I had to leave it behind when I came back to Victoria - I had bought too many books for my suitcase, but the novel remains in a good book fiend's possession. For a blog post on famous bookshops, meander over here. The last link for our inaugural round-up is MC Coolidge's blog post on experiencing a book signing in the Village Bookshop in Bradenton, which is in Florida. Has anybody been there or read MC Coolidge's book? Judging by the cover, it looks intriguing to me. Thanks to Jenny for her graphix. Ballroom Blitzer only came in a few times but I feel he's worth including. Despite being a portly man with miniature feet he had a penchant for Latin dancing which he would bang on about for hours to any available member of staff. Like many Bookshop Irregulars, he also stank. He usually wore navy blue ankle-swinging trousers with suspcious looking stains caked down the front, a baggy black leather jacket and a dingy grey-white shirt... read more and comment. 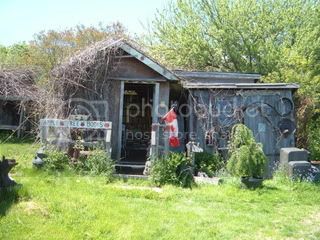 In a farmhouse garden shed in the small (population 386) village of St. Martins is Apple Tree Used Books. With hours listed as "open daily or by chance", it's an interesting diversion that feels a step or two out of time with the real world. An article titled The Elusive Bookshop, which is about a bookshop in London. Wouldst thou like a sample? Dymocks in Market Square is currently undergoing renovation! Last time I walked past there were very few bookshelves, a few handymen, and renovating/constructing type things lying around. It also seemed much roomier than when it is crammed with books. It will be interesting to see how it looks when they re-open later this month, to which I am looking forward. I think they must be starting to re-stock the store very soon. I will see if I can get a couple of pictures when they re-open. Anyone else been in or near any bookstores not in their usual condition? Also, I have a rl friend who will soon be going to England, and there is a bookstore but two minutes' walk from her granddad's house, which sounds amazing! She said it's a small narrow building with several floors. The ground floor is a cafe, and at the back there is a spiral stair case, leading to three floors crammed with books. Doesn't that sound like somewhere you'd want to live? I am imagining it is bluestone, or a nice old sort of red brick on the outside, and dark walnut shelving for the books to rest on until somebody buys them! did some actual proper housekeeping for the first time ever! I deleted that post by apsib--I knew I should have written the name down! I've forgotten it now! Anywho, I deleted it because we're not selling stuff in this community, just discussing bookshops, because we love bookshops! This is a long and narrow shop on Pakington St in Geelong, and it is very full of secondhand books. The window has lots of books on display, and the moment you walk in there are shelves up to the ceiling filled with books, books, books. I usually walk straight past the counter, which is near the door, up the ramp, along that level, up a few steps, and look at the poetry books, and the lit books. Sometimes I go back down the steps and look at the books about animals. It kind of reminds me that I love used bookshops. :) I plan on going to a place like Borders and buying a new copy of a book, but then I swing by my favorite little shop and there are some of the books that I've pondered getting new. They sit there on the shelves and call to me to bring them home. I've been waiting for this day for months! There are so many lovely lovely lit books, and books on writing, and poetry! An amazing poetry section! Ooh ooh I wish I had hundreds of dollars to spend there, and then hundreds of hours to devour the books! And a lovely range of stationery too! Calendars for next year as well. The lit books are not in a U-shaped section of shelving like they are in the Camberwell store, but it is still very exciting to browse in there, because, of course, it is the books that make a literature section such a delight to browse in! Alas, I had no money to spend, but they have been just as well, because I didn't have to choose just one or two books out of those hundreds! Ooh, Borders has Moleskine journals too, which are lovely, but expensive. And so many lovely cookbooks! There are the usual chairs for sitting and reading in, and Gloria Jeans is in there too! I look forward to book-shopping in there, and then getting a coffee in Gloria Jeans and beginning the reading of my purchases whilst I drink a cappuccino. Now, I'm not going to say any more about Borders, because I'm sure you've all been in a Borders, and, like any good chain store, they're all pretty much the same. But I would like to leave you a fun bit of reading to do: go to a library or bookshop, or your bookshelf if you happen to have this book: a collected works of Robert Frost, and find his poem "Canis Major". It's a very nice poem, and I read it while I was in Borders. You may also like to google David Malouf, who is one my favourite poets; I saw his volume Typewriter Music at Borders, and went to the title poem to read it, because it is one of my favourite poems ever. I look forward to the day I have the money to buy that volume! "Typewriter Music" is about how the sound of the typewriter being used is similar to sounds of nature, such as crickets. Is that not reminiscent of a summer's evening, and that relaxed, bohemian feeling that comes over one? The spirit of a large bookstore (a bookstore that is part of a nation-wide chain) often seems to rest in far off pocket books – they have cash registers instead of hearts, Katherine Kelly would probably say*. Not so with smaller shops – shops which exist on quiet side streets and cling to life in the face of retail adversity. I didn’t know Irving and Kay when they opened a small secondhand bookstore across the street from my office, but, over the next two years, they became almost as much of a draw as the books they sold. They remembered what books I liked, what books I brought in, and the company I kept. They would tell me the fates of the books I traded for cash or credit (one poor book was resold three times – two of those times to friends who I would have gladly given it to), point out new books that I would like, and kept me apprised of just how many books my boyfriend was buying a month. A quick nip in for a Nick Hornby book could easily turn into a forty minute chat. They’re gone now. The store was a part time affair and they had better career opportunities in another city. A lovely woman purchased the small shop and she runs it well. Still, I can’t help but miss Irving and Kay. Shelves and books were the body, but they were the heart and soul. * Bonus points if you get the movie reference.